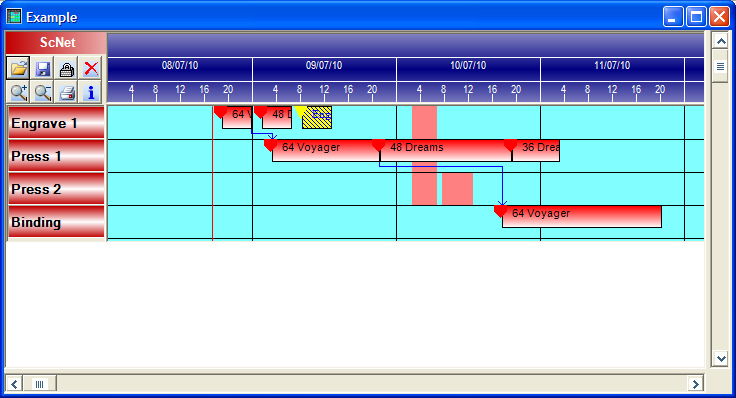 Scheduler Net (ScNet.dll) is a fully interactive Gantt chart component with an amazing scheduling engine. It is available as a Windows Forms Component (Scnet.dll, compatible with any .NET development environment including, but not limited to, Visual Studio) or as an ActiveX Component (Scpro.ocx compatible with any development environment capable of hosting and scripting ActiveX controls including, but not limited to, Visual Basic 6.0 and Access) . This edition has an advanced scheduling engine: the scheduler can allocate a Job list on the Gantt considering non work periods, avoiding block overlapping, according to scheduling parameters and also preserving cycle sequences. The license includes 1 year on line service/updates and the distribution is royalty free! Forward scheduling, Sequencing, Load balancing, interactive Gantt chart, Pert chart, Gradient styles, Chart printing, HTML exporting, Gantt open/save and much more. Scheduler Net customers can also use the Scheduler Pro Edition, which is an ActiveX component that works with any ActiveX container compatible development environment such as Access, Visual Basic 6.0 and many others. Episode 1: resource scheduling, finite/infinite capacity, logical links and costraints.